Mount Herzl ceremony, Ceremonial lighting of the twelve torches, International Bible Contest, Israel Prize ceremony. Independence Day (Hebrew: יום העצמאות‎‎ Yom Ha'atzmaut, lit. "Day of Independence") is the national day of Israel, commemorating the Israeli Declaration of Independence in 1948. It is celebrated either on the 5th of Iyar, according to the Hebrew calendar, or on one of the preceding or following days, depending on which day of the week this date falls on. Yom Hazikaron, the Israeli Fallen Soldiers and Victims of Terrorism Remembrance Day is followed by Independence Day. "The Jews of Palestine ... were dancing because they were about to realize what was one of the most remarkable and inspiring achievements in human history: A people which had been exiled from its homeland two thousand years before, which had endured countless pogroms, expulsions, and persecutions, but which had refused to relinquish its identity—which had, on the contrary, substantially strengthened that identity; a people which only a few years before had been the victim of mankind’s largest single act of mass murder, killing a third of the world’s Jews, that people was returning home as sovereign citizens in their own independent state." Independence was declared eight hours before the end of the British Mandate of Palestine, which was due to finish on 15 May 1948. The new state was quickly recognised by the United States de facto, the Soviet Union, and many other countries, but not by the surrounding Arab states, which marched with their troops into the area of the former British Mandate. Most of the official events take place in Jerusalem, the seat of Israel's government, and are broadcast live on Israeli television. An official ceremony is held every year on Mount Herzl, Jerusalem on the evening of Independence Day. The ceremony includes a speech by the speaker of the Knesset (the Israeli Parliament), artistic performances, a Flag of Israel, forming elaborate structures (such as a Menorah, Magen David) and the ceremonial lighting of twelve torches, one for each of the Tribes of Israel. Every year a dozen Israeli citizens, who made a significant social contribution in a selected area, are invited to light the torches. Many cities hold outdoor performances in cities' squares featuring leading Israeli singers and fireworks displays. Streets around the squares are closed to cars, allowing people to sing and dance in the streets. 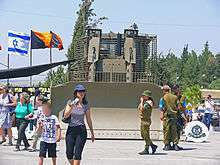 Visitors around an IDF Caterpillar D9 at the Israel Defense Forces exhibition at Yad La-Shiryon, Independence Day 2012. Reception of the President of Israel for honouring excellence in 120 IDF soldiers. The event takes place in the President's official residence in Jerusalem. Israel Defense Forces opens some of its bases to the public. Israeli families, regardless of religious observance or affiliation, celebrate with picnics and barbecues (known in Israeli slang as a mangal – from the Arabic word منقل meaning "stove"). Balconies are decorated with Israeli flags, and small flags are attached to car windows. Some leave the flags hoisted until after Yom Yerushalayim. Israeli Television channels air the official events live, and classic cult Israeli movies and skits are shown. In response to widespread public feeling, the Chief Rabbinate in Israel decided during 1950–51 that Independence Day should be given the status of a minor Jewish holiday on which Hallel be recited. Their decision that it be recited (without a blessing) gave rise to a bitter public dispute, with Agudath Israel rejecting the notion of imbuing the day with any religious significance whatsoever, and religious Zionists believing the blessing should be obligatory. The Rabbinate also ruled that they were "unable to sanction instrumental music and dances on this day which occurs during the sephirah period." The recitation of the blessing over Hallel was introduced in 1973 by Israeli Chief Rabbi Shlomo Goren. The innovation was strongly denounced by his Sephardic counterpart, Rabbi Ovadia Yosef and by Rabbi Joseph B. Soloveitchik, leader of Modern Orthodox Judaism in America. The Religious Zionist movement created a liturgy for the holiday which sometimes includes the recitation of some psalms and the reading of the haftarah of Isaiah 10:32–12:6, which is also read on the last day of Pesach in the Diaspora, on the holiday morning. Other changes to the daily prayers include reciting Hallel, saying the expanded Pesukei D'Zimrah of Shabbat (the same practice that is observed almost universally on Hoshanah Rabbah), and/or blowing the Shofar. Rabbi Joseph Soloveitchik questioned the Halachic imperative in canonising these changes (it is not clear what his personal practice was regarding the recital of Hallel). In any case, the majority of his students recite Hallel without the blessings. A number of authorities have promoted the inclusion of a version of Al Hanisim (for the miracles...) in the Amidah prayer. Most Haredim make no changes in their daily prayers. People affiliated to the Edah HaChareidis mourn the establishment of Israel on Independence Day, claiming that the establishment of a Jewish state before the coming of the Messiah is a sin and heresy. Some even fast on this day and recite prayers for fast days. The Conservative Movement read the Torah portion of Deuteronomy 7:12–8:18, and include a version of Al Hanisim. The Reform Movement suggests the inclusion of Ya'aleh V'yavo in the Amidah prayer. Independence Day is celebrated on the 5th day of Iyar (ה' באייר) in the Hebrew calendar, the anniversary of the day on which Israeli independence was proclaimed, when David Ben-Gurion publicly read the Israeli Declaration of Independence. The corresponding Gregorian date was 14 May 1948. If the 5th of Iyar falls on a Friday or Saturday, the celebrations are moved up to the preceding Thursday. This rule has been effective since 1951. If the 5th of Iyar is on a Monday, the festival is postponed to Tuesday. This rule has been effective since 2004, in order to avoid potential violation of Sabbath laws by preparing for Yom Hazikaron or Independence Day on a Shabbat. “Your independence is our Nakba” is a slogan constantly in use. "Jewish independence is our day of mourning" was chanted by thousands of demonstrating Arab Israelis. On 23 March 2011, the Knesset approved, by a vote of 37 to 25, a change to the budget, giving the Israeli Finance Minister the discretion to reduce government funding to any non-governmental organization (NGO) that organizes Nakba commemoration events. In specific, the law enables the state to fine local communities and other state-funded groups for holding events that mark what the Arab community calls the Nakba. Fines, deducted from a group's operating budget, could equal up to three times the event's sponsorship cost; repeat violations would double the fines. ↑ Oren, Michael B. "Ben-Gurion and the Return to Jewish Power." New Essays on Zionism. Ed. Hazony, et al. Jerusalem: Shalem Press, 2006. 406. PDF. ↑ "Israel Ministry of foreign Affairs: Declaration of Establishment of State of Israel: 14 May 1948". Mfa.gov.il. Retrieved 26 April 2012. ↑ Baruch Kimmerling (1 January 1989). The Israeli State and Society: Boundaries and Frontiers. SUNY Press. pp. 191–193. ISBN 978-0-88706-850-8. ↑ Sir Immanuel Jakobovits (1966). "Controversy: Letters To The Editor". Journal of a Rabbi. Living Books. p. 441. ↑ Alfred S. Cohen, ed. (1984). "Reciting Hallel on Yom Haatzmaut". Journal of Halacha and Contemporary Society. 7–10. Yeshiva Rabbi Jacob Joseph School. p. 17. ↑ Shalom Carmy (2008). "Teacher Not a Spokesman". In Zev Eleff. Mentor of Generations: Reflections on Rabbi Joseph B. Soloveitchik. KTAV Publishing House, Inc. p. 246. ISBN 978-1-60280-011-3. He strictly prohibited reciting a berakha [blessing] on the Hallel. ↑ Jewish Action. 66. Union of Orthodox Jewish Congregations of America. 2005. p. 93. The Rav's famous outburst on Yom Ha'atzamaut 1978 when he called the ceremony for Yom Ha'atzamaut "acute halachic mental retardation" was a result of a deeply held antagonism to all changes in the siddur. ↑ This segment includes Rav David Bar Hayim of the Hardal camp who heads Machon Shilo Institute, (Machon Shilo Al HaNisim for Yom Ha'atzmaut and Yom Yerushalyim), and The Temple Institute, as well as Avi Shmidman and Ben-Tzion Spitz (Shmidman Al HaNissim). ↑ Lucas, Lucas. "Yom Ha-atzmaut: Laws & Customs". Jewish Law. The Rabbinical Assembly. Retrieved 16 April 2013. ↑ Maariv article (in Hebrew). ↑ Elia Zureik (2011). Elia Zureik; David Lyon; Yasmeen Abu-Laban, eds. Surveillance and Control in Israel/Palestine: Population, Territory and Power (Illustrated ed.). Taylor & Francis. p. 17. ISBN 978-0-415-58861-4.